NOTE: This content is old - Published: Tuesday, May 8th, 2018. The A494 Westbound up Aston Hill will be closed from 8pm this evening, Tuesday May 8 to carry out urgent carriageway resurfacing. The works are being carried out overnight after the May bank holiday embargo “when traffic flows are lower to minimise disruption,” The Welsh Governments highway agency has said. The road suffered damage last week after an HGV hit the central reservation damaging the fuel tank, around 30 litres of diesel spilt onto the carriageway. Specialist environmental fire unit was called out to help clean up the fuel leak which caused major traffic disruption in Deeside. 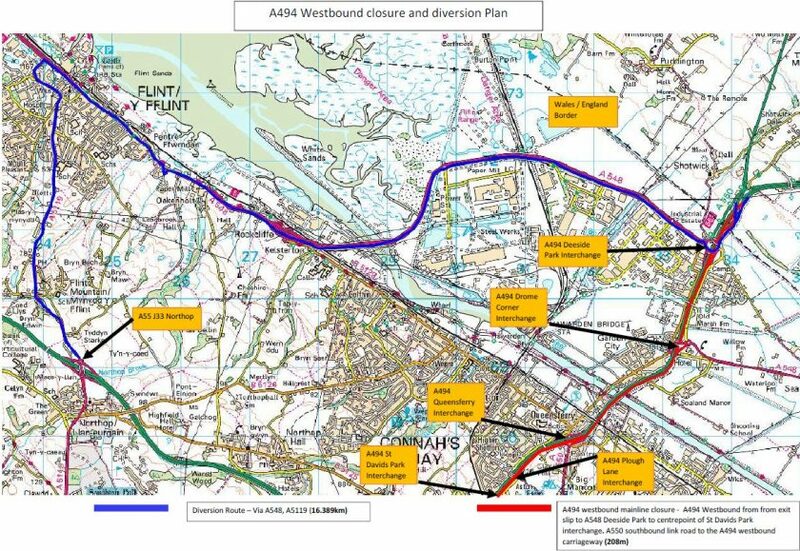 A spokesperson for Traffic Wales said: “The work will be carried out over 1 night from 8pm to 6am on Wednesday under a full westbound carriageway closure (between Deeside Park Interchange and St Davids Park Interchange).